During the winter months there is a chance that your decking could become damaged or discoloured. Fortunately, there are things that you can do to stop this from happening. With a little care and attention your decking will make it through the winter, ready to be enjoyed when summer gets here. The easiest way to keep your decking from discolouring is to keep it clean. This may sound like it is simple enough but there are a few things that you need to be aware of. Pressure washers can damage the fibres of the wood so if you use one you will need to make sure that it is not too powerful. You should also avoid using bleach to clean the wood as this can also cause damage to the decking. The first step in cleaning your deck is to sweep it with a soft brush to make sure that it is free from any debris. After this you will need to mop it with an all-purpose cleaner that does not contain any abrasive chemicals. Staining the decking is a job that should be done on an annual basis. If you do this at the end of autumn or the beginning of the winter then this can help keep your decking protected when the weather starts to turn colder. There are a number of ways that you can apply the stain to your decking. You can use a paint brush or a paint roller. 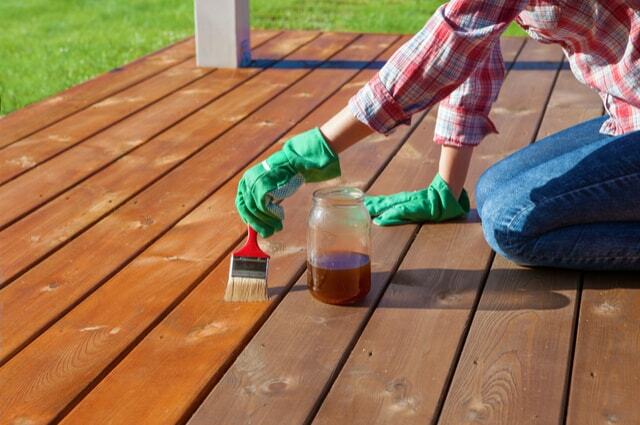 One of the easiest ways to apply the stain to your decking is to use a paint sprayer. Decking oil can also be used to give a little bit more protection to the wood than will be provided by staining it alone. Decking oil is very effective at protecting your wood against the elements because it dries deep into the pores and cells of the wood. The seal that it creates on the wood will stay in place even when the wood expands so it offers a high level of protection against the elements. If you are unsure that the steps you are taking are going to do more harm than good to your decking then it is always worth speaking to a reputable timber merchants. They will be able to answer any questions that you may have and may also be able to recommend the best products for your type of decking that you can use to keep it protected during winter. They should also be able to give you other tips for timber decking and patio decking advice for general maintenance that you can use throughout the rest of the year. Looking after your decking during the colder months may take a little more work than it would do during the rest of the year, but it is definitely something that is worth doing. Not only will it mean that your deck is ready to enjoy when the weather starts to get warmer, regular maintenance will also help to extend the life of your decking.